Ever since people started to fight with each other, more and more effective kinds of body protection have been used. At the beginning, a shield appeared most probably. Next, various types of protective helmet were introduced and finally armors covering the torso were invented. Their shapes differed because of few reasons. Firstly, it should have been taken into consideration what kind of weapon an armor would oppose. Secondly, the kind of available resources was also significant, as well as the development of technology, characteristic for a particular period and territory. The third circumstance may sound trivial, but it had as much influence as the previous ones – namely just personal taste and fashion. Shields were also widely modified. Typically, they were made of a hardened leather patch or a wooden board. Additional enhancements were applied in the form of a metal fitting or a leather veneer. Surprisingly effective was the plait of silk threads and wicker. Over the centuries and continents, the shape and used materials were changed, but the purpose remained similar. In case of an armor, it was different. Over thousands of years two most significant aspects of it were approached differently – namely lightness, resulting in the adequate freedom of movement, and the highest level of protection. In every model, one of these issues was emphasized more. In the 16th century, the armorers were close to the ideal combination, but soon guns became popular, what made the freedom of movement much more important. However, before it happened, armors were highly modified throughout centuries. The view that a plate armor was invented in the early modern era is wrong. First protection of this kind was used as early as in the fifteenth century in Mycenae. In order to create it, brown tapes, bracers and a bevor to cover the neck were combined. Apart from an armor, a warrior was also equipped with a bronze helmet or a leather cap enhanced with tusks. He had also a heavy spear, in order to charge his chariot at the enemy. A bronze greave appeared as early as in the 13th century BC and the characteristic ancient Greek bronze cuirasses were produced even earlier. At the beginning, they were given quite a bell-alike shape and later they started to represent a male torso. They provided the warriors with highly efficient protection, but they were very heavy and expensive. As the form was specific, every cuirass was adjusted to a warrior individually. It is assumed that through Crete, a linothorax reached Greece, which was a light armor based on the Egyptian prototype. It was made of layers of coarse linen, what gave the origin of a scaly armor, created with small metal plates attached to the patch of leather or linen. The basic unit of Greek troops, a hoplite, was named this way because of his shield (a hoplon). It was round, with a diameter of approximately 1 m. It was produced from wood and improved with bronze fitting, what usually reached a weight of about 8 kg. The light infantry, peltasts, also got their name because of the shield they used (a peltarion). It was a so-called Amazon shield, made of wicker covered with leather. At the same time, in Egypt and in the Middle East two completely different types of armor were used. 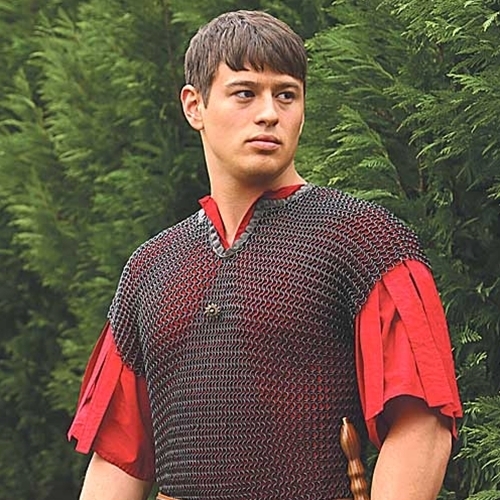 To a linen jerkin, vertical metal strips were sewn and in this way, a light and flexible lamellar armor was created. It was quite loose and it could imitate the usual attire, what explains why this was the preferred type of protection in this part of the world for a long time. The famous ancient Roman legionaries had very humble beginnings in this matter. They covered themselves only with a breastplate, quite small helmet and a shield resembling a hoplon. The officers wore thorax cuirasses, enhanced with additional leather straps (pteryges), which protected hips and arms. The outstanding Celt invention, chain mail, was quickly adapted as lorica hamata. The construction of chain mail was created by the Celts around 5th century BC and from them this idea was culled by different cultures. The biggest advantages of this type of protection were its flexibility and aeration. It was created of overlapping circles, converging in case of pressure, what increased the level of protection. However, in some aspects the flexibility worked to the detriment of a soldier. Namely, he did not have any protection from the blows stroke with a blunt weapon. A club hit is not able to break through chain mail, but it can crush bones underneath. What is more, chain mail was not resistant to arrows with angular, wedge tips which could jostle the rings. It was also possible to cut it with a sabre successfully. The chain mail's mass depended on its size and method of production. It could have 5 up to 18 kg. The heaviest variant reached the knees and had full sleeves and a hood. Only the worst exemplars consisted of butted rings, while in better versions tens of thousands rings were riveted, sometimes even twice. To clean chain mail out of rust, it was put in a sack full of hard wood chips and shaken. The segmented armor (lorica segmentata) was a unique Roman construction. It was created of overlapping horizontal metal plates, which served as protection for the torso, shoulders and arms. Around 3th century AD, it was replaced with a scale armor, probably culled from the Sasanians and Parthians. A scale armor was based on a flexible surface with overlapping small plates attached to it. It was less flexible than chain mail, but as a result, it absorbed the blunt weapon blows more effectively. Moreover, it was easier to produce and to repair. Later, this type of armor was a model for the creators of a corazzina, who wanted to bring the previous glory of the Empire back. Body protection was also used by nomadic people living in the steppes of Central Asia. However, as a result of different conditions, a leather armor was most commonly produced there. First of all it was light, and also effectively shielded from the bow arrows, which was the basis for the offence in the steppe. Apart from simple jerkins made of hardened leather, scale armors were also in use, made of the same material or, interestingly, by the horizontal cutting of horses' hooves. As chain mail was very expensive, it appeared in the steppes only sporadically. Chain mail was the only Roman armor to have survived the fall of the Empire. The only barbarian body protection was usually a shield, but over the next centuries chain mail spread all across Europe and, moreover, in the Middle East. Along with the armor modifications, helmets were also evolving. At the beginning it was only a leather protection for a head, strengthened with animal horns or fangs. Later, it was made of metal. It developed into sophisticated metal constructions. The prototype for more advanced helmets was a bronze protection used by the ancient Greeks. Subsequently, lighter models emerged and they were improved with an additional neck protection and later even a peak. Various tendencies depending on the geographical location can be observed here as well. The European warriors usually wore rounded helmets, while in the Middle East, a pointed shape was the most common. It was not until when a cervelliere, originated from the Normans, gained popularity, that in the Western Europe helmets with clearly shaped summit started to be used. Thinking about the Middle Ages, we usually picture knights as covered in full plate armors. In fact, that is a false image of this period. The Middle Ages lasted for over a 1000 years and a plate armor was used only for approximately 150 years. Earlier, chain mail was the most popular, along with a helmet and a shield of a rectangular or oval shape usually. Between the 8th and 9th centuries, a new model reached the Western Europe from the Byzantine Empire – a kite shield. Soon, it started to be commonly used, as thanks to its special shape, it allowed to protect both the torso and legs efficiently. What is more, it was well-suited for the cavalry. During the crusades, knights wore pot helms, which constituted a new invention at that time. This model was made of a steel sheet, that effectively protected the whole head from cuts and stabs. However, it had several drawbacks. Firstly, it weighted about 3 kg. Secondly, it was hard to breathe inside it and the visibility was largely limited. As the upper surface was flattened, it did not contribute to the blows being slipped off, so in case of a powerful hit, a head could be split along with a helmet. Moreover, a completely covered face made a knight anonymous. As the time went by, these problems were being solved – the cylinder shape became more elongated and flattened on the sides, holes for breathing were added and an oval top was applied, where a jewel was placed, serving as a characteristic decoration which helped to identify the owner. Later, pot helms were replaced with lighter forms - kettle hats, cervellieres or close helmets. A kettle hat was a helmet of an open shape resembling a hat and it was used mostly by the infantry. Cervellieres, at the beginning, served as lighter protection worn under the so-called great helms, which were the pot helms. For a certain period of time, they were called close helmets. However, two independent forms emerged. Cervellieres were the models resembling Italian barbutes, while close helmets were divided into several more categories. At the end of the fourteenth century, the forms of face protection developed vividly and the variants of close helmets were numerous. In case of shields, there was a division depending on which kind of army it was used by – infantry or cavalry. The horsemen, along with the armour modifications being applied, started to use smaller shields – an old kite model was transformed into a shorter triangle, which since the plate armor period had mostly heraldic meaning. A light cavalry used mostly a minimized form of a pavise. Between the 10th and 13th centuries, chain mail was the most popular, at least among the richer knights. Concluding from the iconography observations, some historians claim that a scale armor was equally often used in this period, but there is not enough archaeological evidence to confirm this assumption. At the same time, the offensive weapons also developed. Swords were constantly modified, because it order to break the protection of chain mail, a stab was the most successful. Because of that, additional covering had to be applied. At the beginning, it took the form of metal plates attached to the chest, but as the time went by, new types of protection emerged. Around the second half of the 14th century, a new armor emerged, consisting entirely of metal sheets. The exact data and origin of the first plate armor is not known, but as for those times, it gained popularity very quickly. 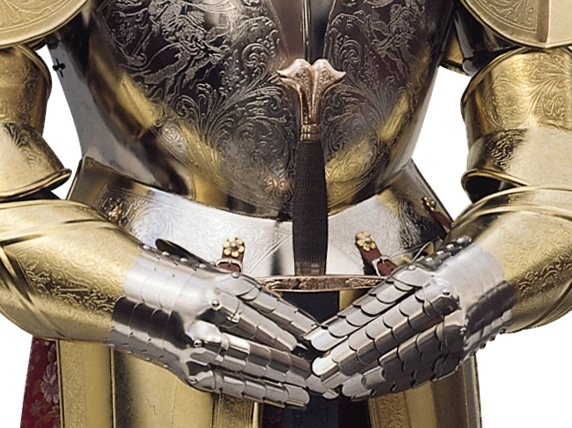 Within 40 years, knights all across Europe were wearing this type of protection. A view saying that a knight in this kind of amor was neutralized just by knocking him over is absurd. Nobody would wear something that makes him unable to move just before going to a battle. These armors were made of steel sheets 1-3 mm thick, depending on a particular body part. The whole weight reached approximately 24 kg. Even after adding the weight of chain mail underneath, it is not an immobilizing load. There remained some descriptions of climbing walls in such a plating. A tournament armor is a different issue. Until the present day, there survived descriptions of putting a knight on a horse using a crane and it could really have looked like this, taking into account that the armor used in jousting lance tournaments was extremely heavy. Even the helmet alone weighted over 11 kg. It was screwed to the rest of an armor. A horseman was sitting in a huge, heavy saddle, which was used for this purpose only. In a real battle, such a solution would fail, because a knight would be unable to even reach a sword, as this kind of protection limited the freedom of movement to a large extent. During an infantry tournament, a specially prepared armor was used, which differed accordingly to the weapons that were fought with. In SPECIALREPLICAS shop you can find a marvellously prepared armor replica, which will allow you to feel like a knight who was fighting in it. You will find out what was the true weight and structure of it, as our products are exact copies of their prototypes. You can wear a historical helmet and imagine that you live in the Middle Ages. 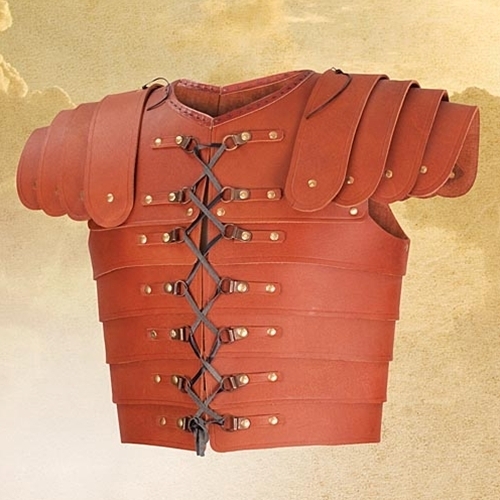 Our armor replicas will make an ideal gift for history or military lovers and not only.